Someone ought to be plastering “MISSING” signs all over Milwaukee in order to find the Brewers’ offense. It hasn’t been seen since August 2015, and people are starting to worry. Myself included. The Brewers are dead last in runs and home runs, and that has a resulted in an improbable 53 wRC+. (That means they’ve created 47% fewer runs than league average.) It hasn’t helped that Ryan Braun has just one extra-base hit to his name and Jonathan Lucroy — who was just placed on the disabled list with a broken toe — has looked like a zombie at the plate. But the lack of scoring doesn’t just boil down to two players. There’s plenty of other ingredients that go into it. One of those missing ingredients is the team’s inability to hit pitches in the lower half of the zone. Let’s take a look at the strike zone so I can better illustrate where the problems lie. 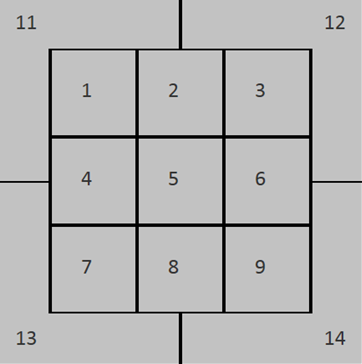 Because I wanted to find out how the Brewers perform on pitches in the bottom of the zone (zones 7,8.9), I went to Baseball Savant and sorted pitch location by batting average. With just how bad Milwaukee’s offense has been, the results didn’t really surprise me. On pitches in zones 7, 8 and 9, the Brewers have a measly batting average of .198 (21 for 106), which is the lowest mark in Major League Baseball. It seems as if opposing pitchers have picked up on this out as well. Only six teams have seen more pitches in those areas of the zone, meaning pitchers are pounding it because they know Milwaukee is incapable of doing anything with their low pitches. Lucroy has had the most success against low pitches, going for 7-for-16, and Braun is 4-for-12, but other than that, the Brewers have produced nada. Carlos Gomez, Jean Segura and Khris Davis have combined to go 2-for-28 (.071). Struggling low in the zone isn’t new for the Brewers. In 2014, they hit .276 in those three zones, and while that batting average is infinitely better than why they’re at now, the Brewers still finished 26th out of 30 teams. Not many home runs come from pitches down in the zone, so for a team explicitly built to hit home runs, one shouldn’t expect much production. And I think that’s the issue. For at least the last few years, the Brewers have been programmed to hit home runs or lose. They’re not an on-base percentage team, they’re an all or nothing team. And the latter has been winning for quite some time now. This entry was posted in Strike Zone and tagged carlos gomez, Jonathan Lucroy, Milwaukee Brewers, Ryan Braun on April 21, 2015 by Justin Schultz. What went wrong in Matt Garza’s start? Matt Garza followed Kyle Lohse‘s poor start on Opening Day with one of his own, managing just five innings and allowing four runs on eight hits. The Colorado Rockies hit Garza so hard, that he and Jonathan Lucroy switched up their signs midway through the game in case he was tipping his pitches. 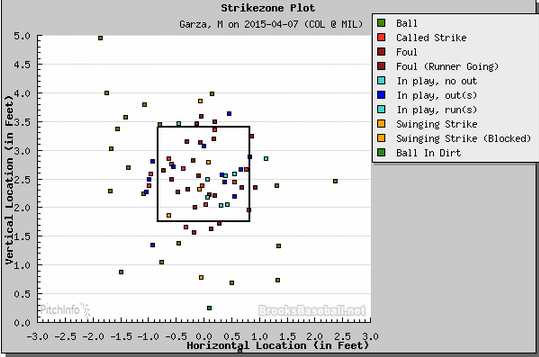 Despite his confidence, Garza only threw his slider nine times. That doesn’t sound like much of a new toy, nor does it sound like it’s very fun to play with (three of the four sliders that were put in play went for base hits). The truth is, however, that Garza needs his slider to be successful, and from his comments above, he’s well aware of that fact. He threw it 21.7% of the time in 2014, the lowest rate since 2010, and that needs to change this season. Increased slider usage should create an uptick in strikeouts (he had just two on Tuesday) and take pressure off his fourseam fastball of which he threw 43 times out of 81 pitches. In addition to his limited slider use, Garza had a difficult time locating his pitches. He spent a lot of time in the middle portion of the zone, which is where the majority of Colorado’s hits came from. Garza rarely challenged hitters up in the zone, and when he did, they fouled him off. Garza was actually pretty lucky he allowed just five runs considering the Rockies posted a .381 BABIP that included more doubles than I could count. Fortunately, he kept the ball in Miller Park and Garza allowed just one free pass. Going forward, Garza needs to work the corners more. He also can’t be afraid of utilizing his slider more or going up in the strike zone with his 93 mph fastball. This entry was posted in Short and Sweet and tagged Colorado Rockies, Matt Garza, Milwaukee Brewers on April 8, 2015 by Justin Schultz.